Or if traveling I-85, join 95 south of Richmond; Around Richmond, follow signs that state I-295 South/ I-64 East to Norfolk/Williamsburg. Follow Mercury Blvd until it becomes James River Bridge/Route 17 and cross over the Bridge into Isle of Wight County; At turn right onto Route 10/32 Smithfield; At first light, turn right onto Route 10 West; Turn right onto Route 258 (Main Street) and follow shortly into the Historic District of Smithfield. Alternate route if coming from the Northwest or South : You can follow I-81 North to Blacksburg and pick up Route 460 East, which is for the majority a 4 lane divided highway; Follow Route 460 East for approximately 40 miles to the intersection of Route 258 at Windsor; Turn left onto Route 258 and follow for approximately 15 miles where 258 becomes Main Street in the Historic District of Smithfield. ENTRANCE: Located front and back. No exterior steps. Doors easily opened. 4 entry doors, 38 in. wide, open out with pull handle located 38 in. above floor. Glass doors have handles clearly marked in contrasting color. No steps inside. FACILITIES: No steps leading to restaurant or other public rooms. Signage printed in contrasting colors, raised lettering, and recessed lettering. Increased wattage lighting in dining areas. PUBLIC REST ROOMS: Located on the first floor, available without steps. Doors are 35 in. wide, opening in. Turns to enter. Large single bathroom. Toilet seat 18 in. high, handrails. 10 in. between commode and wall. Sink height 34 in. Wrapped pipes. Accessible stall checked for obstructions. Unisex or companion assisted rest rooms available. Rest rooms identified by raised figures with pants or skirt on the door to designate men or women. DINING: There are 10 tables for guests in wheelchairs, located in the front and rear. Table height is 30 ½ in. Aisle width between tables is 40 in. Menus are available in large print and on non-glossy surface. 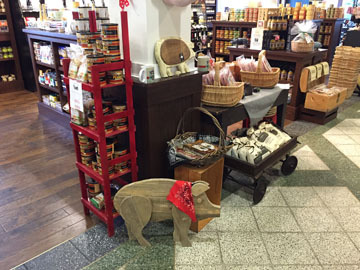 GIFT SHOP: We are home of the Peanut Shop of Smithfield and the Genuine Smithfield Ham Shoppe. Width of aisles 43 in. Counters 34 in high. Aisles clear of temporary displays. 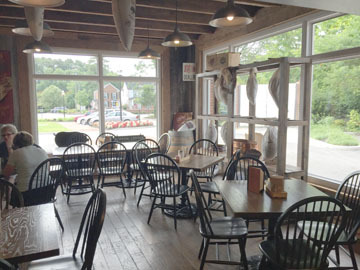 The charming specialty shop is the “face of Smithfield Foods” and is proud to offer its world-renowned Smithfield Hams, bacon, BBQ sauces, peanuts and other gourmet items. 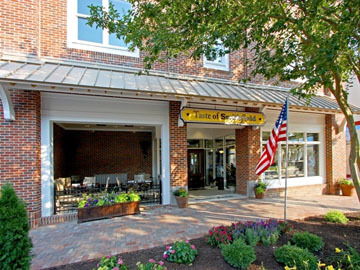 You’ll also enjoy their selection of pig and bacon collectibles, gourmet specialties, a wide variety of Virginia wines, gift packages and so much more. The Peanut shop phone number is 757-357-1798. We also have a UPS station in house so we can ship all over the US. STAFF TRAINING: Serving staff are trained to serve guests using wheelchairs, guests having mobility, visual, or hearing disabilities. 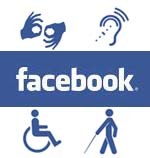 All staff members have worked with management on helping anyone with disabilities. This is not formal training but common sense training. Helping at the doors, help finding a good location for getting in and out of dining area, helping with the menu, helping to locate restrooms and in general making everyone feel good about visiting the Taste of Smithfield. We want everyone to have a good experience when they visit Smithfield. We discuss issues as a group and try to come up with ideas that make it easier for anyone with a disability. SAFETY PROCEDURES: Smoke alarms in all areas. Additional emergency measures for wheelchair/mobility disabilities, visual disabilities, and hearing disabilities. We have an emergency procedure for moving people out in case of a fire or any other emergency. Anyone with a disability is moved out first. 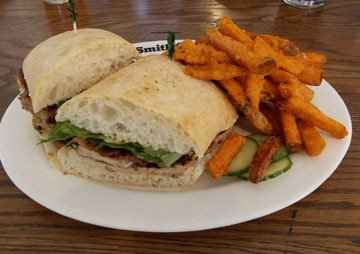 The Cafe features signature Smithfield Ham and pork products, 100% Certified Beef Angus burgers, signature sandwiches served on gourmet breads, fresh salads, homemade soups, delicious sides and homemade desserts. We also have craft beers on draft from some of Virginia’s best micro-brewers and wine from Virginia’s best winemakers. Southern never tasted so fresh. The Taste of Smithfield is open Sunday thru Thursday from 7am to 7pm, Friday from 7am to 10pm and Saturday from 7am to 8pm. We sell gift certificates that make wonderful gifts.